Thank you very much for being here and sharing with me the love and passion for healthy cooking and a healthier lifestyle. A friendly and transparent relationship with my users is fundamental for me, for this reason, I invite you to read carefully all the information related to the legal terms and conditions that define the relationships between users and me, as responsible for this web. As a user, it is essential that you know these terms before continuing your navigation. Eloisa Faltoni, responsible for this website, assumes the commitment to process the information of users and customers with full guarantees and comply with national and European requirements that regulate the collection and use of personal data of my users. These General Conditions regulate the use (including the mere access) of the web page of the Cooking with a Cat’s website, including the contents and services made available in them. Any person accessing the website ungatoenlacocina.com (“user”) accepts to submit to the General Conditions in force at each moment on ungatoenlacocina.com. The user is informed and accepts that access to this website does not imply, in any way, the start of a business relationship with Cooking with a Cat. In this way, the user agrees to use the website, its services, and contents without contravening current legislation, good faith, and public order. In the use of the website ungatoenlacocina.com, the user undertakes not to carry out any conduct that could damage the image, interests, and rights of Cooking with a Cat or third parties or that could damage, disable or overload the portal ungatoenlacocina.com or that prevents, in any way, the regular use of the web. However, the user must be aware that the security measures of computer systems on the Internet are not entirely reliable, so Cooking with a Cat cannot guarantee the absence of malware or other elements that may cause alterations in the computer systems (software and hardware) of the user, or in their electronic documents and files contained therein. Anyway, I put all the necessary and appropriate security measures, to avoid the presence of these harmful elements. The personal data communicated by the user to Cooking with a Cat can be stored in automated databases or not, whose ownership corresponds exclusively to Eloisa Faltoni, assuming all the technical, organizational and security measures that guarantee confidentiality, integrity and quality of the information contained in them in accordance with the provisions of the current regulations on data protection. The communication between the users and ungatoenlacocina.com uses a secure channel, and the transmitted data are encrypted thanks to protocols at https; therefore, I guarantee the best security conditions so that the confidentiality of the users is ensured. By the provisions of articles 8 and 32.1, second paragraph, of the Law on Intellectual Property, the reproduction, distribution and public communication, including the method of making them available, of all or part of the contents of this web page, for commercial purposes, in any support, and by any technical means, without the authorization of Cooking with a Cat, is expressly prohibited. The user agrees to respect the rights of Intellectual and Industrial Property owned by Cooking with a Cat. The user knows and accepts that the entire website, containing text, software, content (including structure, selection, arrangement and presentation of these) podcast, photographs, audiovisual material and graphics, is protected by trademarks, rights of author and other legitimate rights, in accordance with the international treaties to which Spain is a party and other property rights and laws of Spain. Personal data of the owner of the rights allegedly infringed, or report the representation with which he acts in case the claim is presented by a third party other than the interested party. Indicate the contents protected by intellectual property rights and their location on the web, the accreditation of the intellectual property rights indicated and a declaration in which the interested party is responsible for the integrity of the information provided in the notification. The only purpose of the links is to provide the user with the possibility of accessing these links. Cooking with a Cat is not responsible in any case for the results that may be derived to the user by accessing these links. Also, the user will find on this site, pages, promotions, affiliate programs that access the browsing habits of users to establish profiles. This information is always anonymous, and the user is not identified. On this website, comments are allowed to enrich the contents and make queries. Comments that are not related to the theme of this website, including defamation, insults, personal attacks or lack of respect in general towards the author or towards other users will not be accepted. The web administrator will delete these comments. Comments that contain information that is misleading or false, as well as comments that include personal information, such as private addresses or telephones and that violate our data protection policy will also be deleted. Likewise, comments created only for promotional purposes of a website, person or group and anything that could be considered spam, in general, will be rejected. The lack of legality, quality, reliability, usefulness, and availability of the services provided by third parties and made available to users on the website. 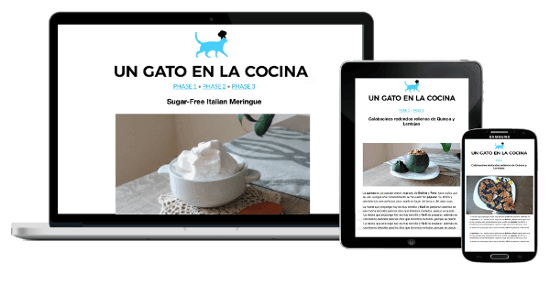 In general, the relationship between Cooking with a Cat and the users of its telematic services, present on this website, are subject to Spanish legislation and jurisdiction and the courts of Barcelona. In case any user has any questions about these Legal Conditions or any comments about the ungatoenlacocina.com portal, please contact eloisa@ungatoenlacocina.com. These terms of services had been updated for the last time on 05/24/2018.